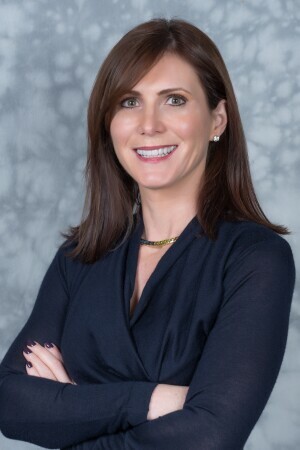 MIX SHIFT: AFFORDABILITY AND LESS SQUARE FOOTAGE Zelman spotlights pricing 'headroom' compared with historic price, household income data. In the 1990s and 2000s, a non-supervisory or production worker who owned a home paid 42 cents of every dollar he or she earned in monthly payments for principal, interest, and mortgage insurance for the opportunity for homeownership. In the fourth quarter, homeowners spent 15.8 percent of their incomes on a mortgage, which is below the 21 percent that homeowners spent, on average, from 1985 to 2000. "Relative to the current 36% ratio, holding all else constant, it would take an approximate 25% increase in home price or a 30-year mortgage rate of 6.25% to return to the historical average. 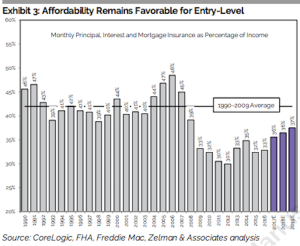 Overall, we worry more about the perception of affordability constraints and the lack of entry-level inventory than the level of home prices today." Evidence on the lack of inventory, Zelman analysts observe, is in the fact that for-sale existing and unsold newly constructed homes today add up to just 1.5% of all U.S. households, a historic low. Average available for-sale housing inventory ran at a level 35% to 40% higher in the 1990s and 2000s than today. Again, Zillow data-sets corroborate Zelman's findings, directionally, although the baselines and assumptions differ. The conclusions are the same. Inventory, which drives home values and, indirectly, rents, continued to worsen in April: There were 7.7 percent fewer homes on the market in April than a year earlier, with Minneapolis, Columbus, Ohio, and Seattle each posting inventory drops of more than 20 percent. The markets with the greatest inventory growth were Las Vegas (24.9 percent) and Austin, Texas (20.5 percent). The takeaway, ultimately, in Zelman's June 2, 2017 The Z Report, is that when job growth among those non-supervisory and production worker headcount positions is strong and consumer confidence is solid, the demand pool is growing, as is price elasticity. People will pay more of their incomes than they currently need to, so there's headroom in the market, even though prices are rising. At the same time, a more recent phenomenon--a shift in the for-sale supply mix--will cause a raft of new stories about how houses are getting smaller, regulations are less of a burden, and price appreciation is flattening, and labor costs are being brought into control, despite labor capacity bottlenecks and unevenness. All of these "new" trends are a direct result of the long-awaited activation of first-time buyers of entry-level homes--from a level well below historic norms to one that has begun to move in the direction of longstanding averages. 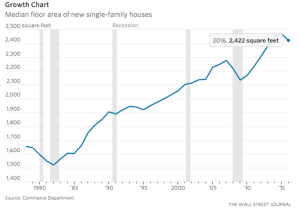 Here's a story from Wall Street Journal staffer Jeffrey Sparshott (paywall) citing recently released housing characteristics data from the Census Bureau that indicates that after quantum leaps upward in square footage since the recession began, home sizes actually shrunk a bit--2%--in 2016. Not because home builders are suddenly listening to progressive architects who believe our houses far exceed what we need in terms of livable space. The reason home sizes are now "smaller" is that smaller houses are selling more. In other words, more people who can finally buy a home at all are buying homes they can afford, which are, by and large, less square footage than the homes more well-heeled buyers were purchasing. For a "sample of builders in Atlanta, Austin, Charlotte, Dallas, Houston, Jacksonville, Orlando, Phoenix, San Antonio and Tampa, the share of available inventory sized under 1,800 square feet increased a similar 80 basis points on average in 2016 from 2015. Importantly, in 1Q17, the share was 100 basis points higher than in 1Q16, a clear sign to us that outsized growth of entry-level new construction in 2016 was the start of a trend that we believe could last numerous years." If you're interested in becoming a subscriber to The Z Report, which is a twice-monthly package of original, exclusive data and analysis from the team at Zelman & Associates, you can try it for free by linking here. 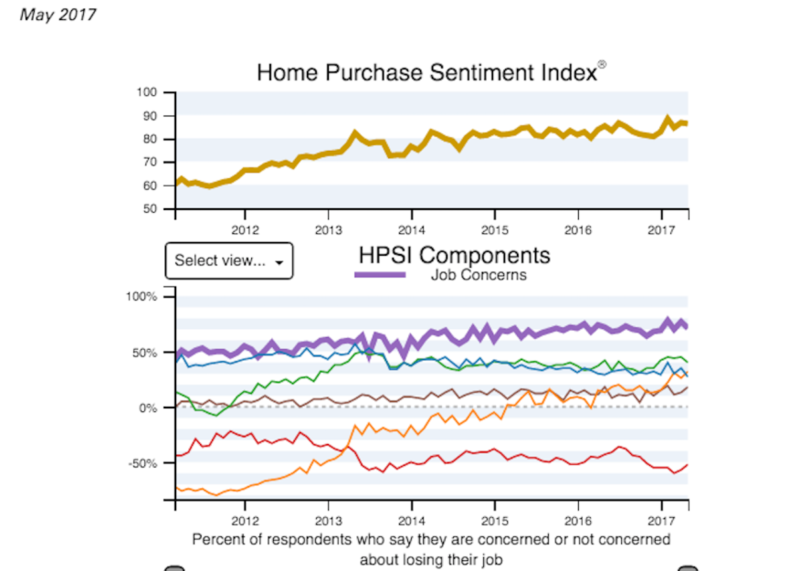 What it comes down to may be summed up in Fannie Mae's most recent Home Purchase Sentiment Index, which shows solid indications that it's a seller's market. Which only goes to show that a lot of people also think it's time to buy.